In the study published in SCTM, researchers at Zhongshan Hospital (affiliated with Fudan University) in Shanghai tracked 27 AICLI patients for five years after each had received an intramuscular injection of PuCeT to treat their disease. 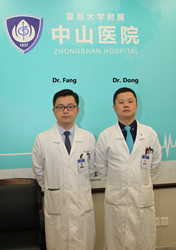 “The primary endpoint – major-amputation-free survival rate – as well as secondary endpoints such as peak pain-free walking time and the scale of the patient’s pain, were routinely evaluated during the five-year follow-up period,” said Zhihui Dong, M.D., who along with his Department of Vascular Surgery colleague Weiguo Fu, M.D., served as corresponding authors on the study. “Notably, in 17 patients (65.38 percent) not only were their limbs saved, but they also fully recovered their labor competence and returned to their original jobs by week 260. PuCeT demonstrated long-term efficacy and durability as a treatment of AICLI, not only in achieving limb salvage but also in recovering the labor competence and improving the patient’s quality of life,” Dr. Fu added. The full article, “A five-year study of the efficacy of purified CD34+ cell therapy for angiitis-induced no-option critical limb ischemia,” can be accessed at http://www.stemcellstm.com.